A member of the great Ennead, Nephthys (Nebthet) was a daughter of Geb and Nut, and sister to Osiris, Isis, and Set. She was Setâ€™s consort, but her only child was conceived in secret with Osiris. In many versions of the myth, Nephthys is the mother of Anubis. Nephthys was a goddess of death, darkness, decay, and regeneration, although she was not considered to be evil like her husband. She personified the concept of life springing forth from death, and was a powerful healer. She was a symbol for the edges of the desert, which were harsh and barren, unless the Nile brought fertile soil during the flood. In the Afterlife, she watched over the head of the deceased, as well as Hapy, the Son of Horus who was responsible for the lungs. 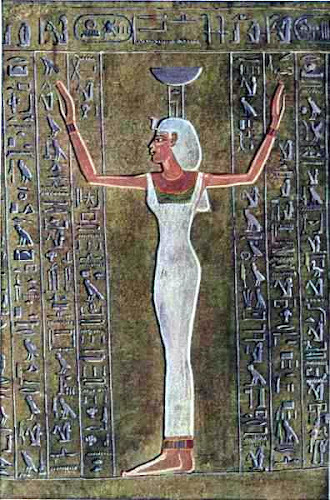 Like her sister and friend Isis, Nephthys was usually depicted as either a woman or a kite, a bird of prey with outstretched wings. It was in this form that the two sisters protected the body of Osiris before burial, and they are often portrayed this way together in tombs and on sarcophagi. In human form, Nephthys wore a crown made up of the hieroglyphs of her name â€œLady of the Mansionâ€ - a basket resting atop a house - which represented the domain of the gods.